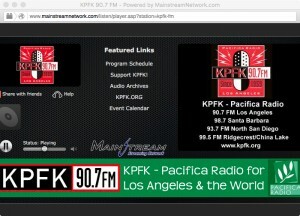 Radio Station KPFK 90.7 FM gave airtime to SaveKeiro.org on its Thursday morning news show, Uprising! Co-host Faith Santilla interviewed Ad Hoc Committee Member Dr. Takeshi Matsumoto, allowing him to educate the radio station’s listeners on the issues surrounding the pending sale of the Keiro Facilities to Pacifica Companies, a real estate developer. Dr. Matsumoto spoke about the history of Keiro and why the Keiro facilities are unlike the majority of retirement homes and the need for its continued existence. He also brought to their attention the realistic possibility of redevelopment of the properties, removing a home for the Japanese American elderly in favor of high-rise condos or luxury apartments in the near future, leaving uncertain futures for many residents, and asked the public for its support to right this injustice. The interview begins around the 2:00 minute mark and lasts approximately 16 minutes. CLICK HERE to listen to the archive of the interview.